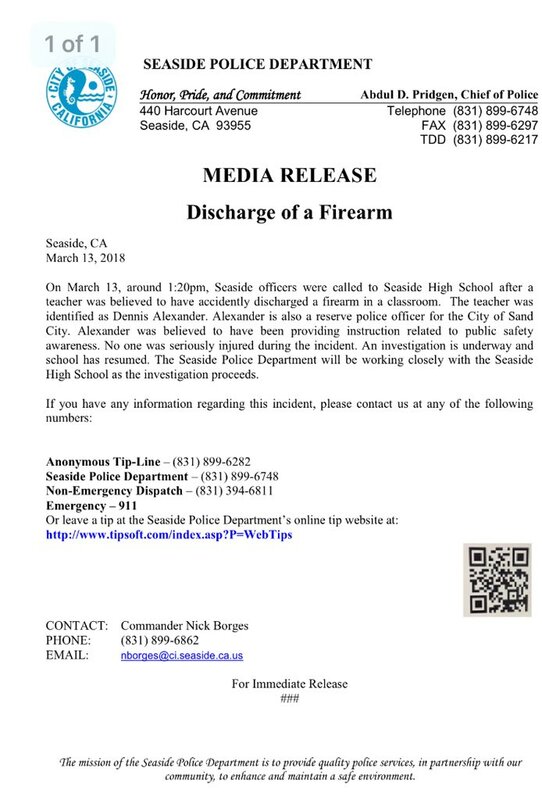 A teacher who is also a reserve police officer trained in firearm use ‘accidentally’ discharged a gun Tuesday at Seaside High School in Monterey County, Calif., during a class devoted to public safety, school officials said in a statement. A male student was reported to have sustained non-life-threatening injuries. The boy’s mother, Crystal Gonzales, told the Associated Press Wednesday that the incident took place about 10:30 in the morning and that the class continued after the gun discharge, even though her son was injured. She said she did not hear about it until her son called her hours later and went to a relative’s home. The teen was treated at a hospital where the boy’s parents took him. A spokeswoman at the Monterey Peninsula Unified School District told The Washington Post Wednesday that they would not comment further until an investigation was completed. The teacher was identified by police as Dennis Alexander, who teaches math as well as a course in the administration of justice. Alexander is a reserve police officer for Sand City and a Seaside city councilman. He did not respond to emails from The Washington Post seeking comment. He has reportedly apologized for the incident. What made Hawking’s ‘A Brief History of Time’ so immensely popular?